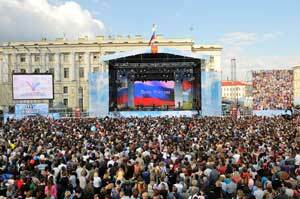 Russia Day falls on June 12th each year and celebrates the beginning of democratic reforms taken in Russia as well as honoring great Russian. The President will hand out national awards to Russian citizens that have done great works in the areas of science, business, and humanitarian work. Some people attend concerts and firework shows. Many Russians see the democratic reforms as moving backwards and will not celebrate this holiday. June 12, 1990, Soviet Union's leaders signed a document that moved Russia more towards democratic reforms and marked the end of the Soviet Union. June 12 became the public holiday created to celebrate the signing and the new reforms but many in Russia do not celebrate this holiday. In 1997 Boris Yeltsin in an effort to get more people to celebrate the holiday requested to rename the holiday Russia Day and later in 2002 it was passed in the Russian parliament to its current name.